Did you know that the average american consumes about 3.4 pounds of Halloween candy every year? And that over 598 pounds of candy will be sold throughout the states this year? That’s a lot of candy! And the chances are very good that you and your family will be encountering some of these treats very soon. In fact, with bags of Halloween candy already stacking up in the stores throughout Seattle, it’s just a matter of time before these tasty treats wind up coming through your front door and wreaking havoc on your family’s daily dental hygiene. So, the annual Halloween bandwagon is in full force. Can you stop it? You can’t. And really you shouldn’t. Halloween is fun and festive time of year. It’s a time of year that brings out the inner kid in all of us. Rather than trying to be a party pooper and put a damper on the fun times, there are some tricks you can do to help protect your family’s teeth from these treats over the next month or so. Here are 5 Tricks to Protect Your Teeth from Treats this Halloween! 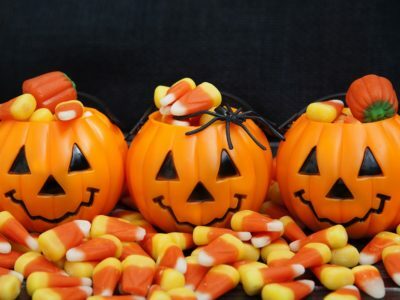 You can enjoy still enjoy the treats, the Halloween spirit and be mindful of those lurking sugar bugs that can lead to cavities and tooth decay. Happy Halloween to you from all of us at Westview Dental! Learn how to protect your teeth this Halloween!